General McMahon was the last American ambassador in the Lopez government. He arrived in Paraguay in December 1868, just when the Allies launched their final assault in Lopez positions at Paraguay River. He accompanied Pres. Lopez in his flight to the interior of Paraguay after the defeat in the Lomas Valentinas battle. 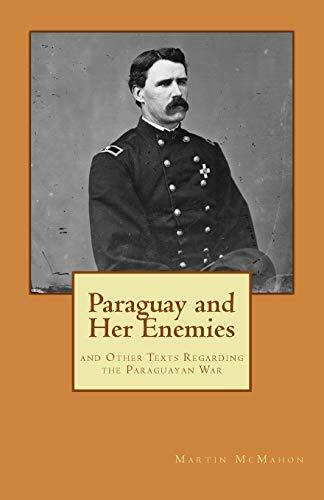 McMahon was a sympathizer of Lopez, and when he returned to US he wrote several favorable texts to Lopez which two of them are reproduced in this book, the "Paraguay and Her Enemies" and "War in Paraguay." The latter is especially important because it is the only eyewitness account from the Paraguayan side regarding the Lomas Valentina battle and Lopez escape. Also included in this edition is document refuting Gen. McMahons assertions regarding Lopez and the Paraguayan War. Probably it was written by Porter C. Bliss that was imprisoned and tortured by Lopez orders.